Thomas and his co-stars are simple and their behaviors limited, but in the course of playing the game we start to associate personalities and motivations for them. The short orange rectangle, for example, seems grumpy and cynical. The tall yellow block seems proud and arrogant. The game does feature a narrator that makes some of these things explicit, but I think we probably don’t really need that much assistance with assigning character, motivation, and agency to simple shapes. There are, in fact, psychological roots to this kind of inclination to assign character and internal thought processes where none exist. We are wired to perceive a narrative in the events that happen around us, and we’re more satisfied and think events are more truthful if they’re part of such a narrative. Politicians and marketing professionals use this all the time based on the knowledge that an audience will believe something more if it’s presented in the form of an easy to understand story with an appropriate structure, characters, and motivations. If a message or experience doesn’t have all those pieces, we’ll often supply them ourselves. In 1944, Fritz Heider and Marianne Simmel explored this narrative bias by creating a short film to show and discuss with subjects.1 Watch it below before reading on. Don’t worry, it’s only about 90 seconds long and has no sound. Now, you answer the simple question that Heider and Simmel asked their subjects after showing this clip: “What’s going on here?” Did you create a little story to explain the movements of Mr. Triangle, Mr. Other Triangle, and Mrs. Dot? Was one of them a jilted lover? An overprotective brother? A tricky cyborg bear of some kind? All of Heider and Simmel’s subjects came up with some kind of narrative like these, despite the simple nature of the shapes and the abstractness of the whole thing. Nobody just said “These shapes moved around for no reason.” Nobody. For sure, if an explanation is offered to us in the face of ambiguity, we’re likely to take it. Like Heider and Simmel’s clip, Thomas Was Alone creates so much character out of similarly simple shapes because of the same principle –it’s just that we accept the game’s narrator’s account instead of making up our own.2 But when there’s ambiguity or the narrator leaves something out, we fill in the gaps with familiar, easy to recall materials from our own experiences. And once we create a narrative, we tend to do whatever mental gymnastics are needed to keep it going, chapter after chapter. 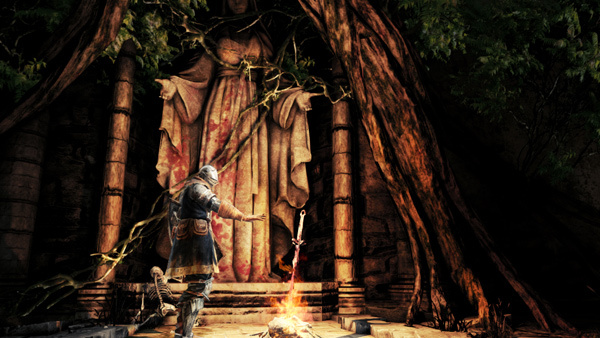 This is part of the reason why I think the Dark Souls games are so compelling.3 The games don’t give you a lot of information about what’s going on, and what you do get is either from item descriptions or by paying attention how things look in the environment. Why are these guys guarding this castle? Why are they carrying these particular items? What did that NPC mean when they said that they don’t recognize this place? The bias toward wanting to place what we see within a larger narrative context highlights the lack of information in the first place, but our interpretation of what is there and what we make up out of whole cloth is also driven by the narrative bias. Once we settle on a narrative, we tend to ignore, downplay, or reinterpret information that goes against it. Thus part of the appeal of Dark Souls for many people is giving the itch caused by this mental fallacy a good scratching. Constructing the narrative can be more fun than having it handed to us. So there you have it. Thomas Was Alone and Dark Souls 2. Same game, basically. Because psychology. 2. It would be an interesting experiment, I think, to play the game muted or without the narrator and see what kinds of descriptors people come up with for Thomas and what explanations they propose for what he’s doing. 3. Yeah. That’s right. I just brought up Thomas Was Alone AND Dark Souls in the same post. Weird, right? ← The Psychology of Video Games: The Book Is Coming! I feel saddened that nobody mentions Brink in these sorts of discussions. Brink did a lot of work to leave an “imprint” of a story on a multiplayer-only game. They effectively created a narrative, and then “peeled it off” to create the game, which contains a sort of shadow of the events that occurred. Dark Souls does the same. To some extent, I disagree that the triangles clip is actually _not_ meaningful. It contains far too much embedded information to lack meaning. The movement is clearly not, say, physics based. It’s clearly with intent, it’s very “human” (or at least animal). When you look at the Karl Sims video: https://www.youtube.com/watch?v=JBgG_VSP7f8 you truly get a sense for the AI that the “characters” are exhibiting. In short, I don’t think we’re seeing patterns that aren’t there, rather that we are able to perceive patterns which only leave their footprints behind. That Karl Sims video is one of the most fascinating things I’ve ever seen, thanks. It disappointed me that this game had both a “humorous” narrator that explicitly tells you everything, and a traditionally “emotional” score. It’s like they only went halfway with the experiment. It would be a nice experiment to make people play Thomas Was Alone without text or narrator and ask them about the shape’s personalities. Actually, this is exactly how the story in TwA came to be. Back when it was a flash game on Kongregate, Mike Bithell read comments like “the orange one looks grumpy”, or “the tall one is such a show off”, and the narrative was born. There’s a talk he gave at Nordic Games 2014 that briefly flirts with the narrative; it’s quite interesting. Just wanted to say that the Heider-Simmel demonstration video doesn’t work anymore. I am actually rather curious to see the difference between a lack of explain information leading to an assumed narrative/filling in the gaps, as seen in Darks Souls or Limbo. Compared with when a lack of narrative information makes the narrative feel patchy, leaving the player feeling cheated. A prime example of this in recent history is Destiny. Both leave a lot of information unexplained, but to very different degrees of success.